So does Langland record Weyhill Fair, in Piers Plowman, in 1377, the largest and most important livestock fair in the country. One of the features were the establishment of booths to sell produce and so many hops from Farnham were sold that they became known as Farnham row. Like many great fairs despite an ancient provenance it was like others a charter fair…like others it did attract fringe activities – hiring of labour, a pleasure fair, bull baiting and even mummers and mystery plays. Twelve twenty five is the fair’s earliest reference being called Fair of Le We then. However this is not a charter. Indeed, the lack of a charter is perhaps because the fair was very ancient lying as it does on ancient crossroads which crisscrossed tin merchants, gold transporter and even pilgrims from as far as way as Cornwall, Kent and the Continent. 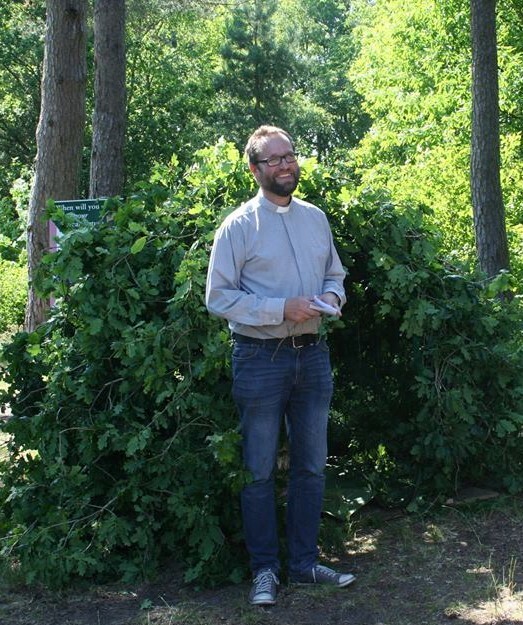 Laying also on three parishes and three estates helped it escape the need for a Charter. For when in Andover town folk claimed a right to hold their own fair, by 1559 Royal charter, the fair owners claimed that the rules did not apply to their fair! As it grew into the 19th century the volume of trading grew exponentially. Cheeses from all over Wessex were sold and around 100,000 sheep were sold in one day. Irish horse traders were accused of putting everyone in danger by showing off ‘charged up and down, and over hurdles’. Lawlessness was a common problem and so large was the fair that by the 16th century it was necessary to set up a Court of Pie Powder. This a common feature of large fairs was a court which provided quick settlement on disputes and could punish lawlessness. Wife selling was a custom associated with many fairs and one immortalised by Thomas Hardy in his 1886 The Mayor of Casterbridge. Renamed Weydon Priors one of his characters, Henchard, sells his wife for five guineas. Wife selling was not unknown in the days before divorce was relatively easy and affordable. An account records that a man called Henry Mears bought Joseph Thomson’s wife for 20 shillings and a Newfoundland dog – he was originally asking 50 but the account states both parties were happy. I am not so clear as the wife’s opinion. Reports suggest that despite being still the biggest fair in the South in 1867 each year less and less hops and cheeses were being sold. Sheep and cattle continued to be trade until just after the Second World War. In 1948 only 1400 sheep were sold – a far drop from the 100,000s. The rapid progress of modernity, better roads, rail and communications meant such large meetings were unnecessary. Although the pleasure fair continued to thrive as in many places. 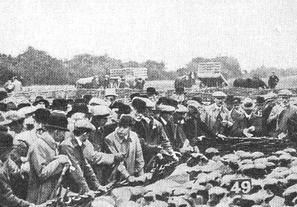 In 1957, the last livestock auction was held and then so few animals were sold that the auctioneers deemed it unprofitable. So the fair stopped and unlike other fairs such as Nottingham Goose fair so did the pleasure fair. 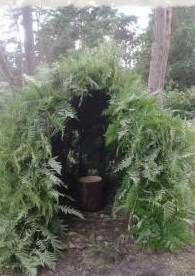 The booths were bought by a building company Dunnings Associates using them for storage. They themselves went bankrupt and the buildings fell into disrepair. 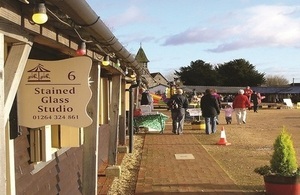 The site is now a light industry site with the Fairground Craft and Design Centre continuing the name and tradition of selling. The March posts all have a theme if you can notice it…. On the 25th March each year, the usually sleepy Hampshire village, remembers its heritage and perhaps, at the same time, preserves and underlines the role of the village gentry in the welfare of the village, an aspect largely forgotten as villages become satellite settlements for larger cities! This they do by distributing the Tichborne Dole, one of the most famous and largest distributions surviving in England today. Its survival is perhaps surprising, with many such villages not exactly thronging with obvious ‘poor’, but its survival is as much to do with its peculiar legend as its usefulness of its distribution being flour which although perhaps not as prohibitively expensive, useful nevertheless! The origin of the custom dates back to the reign of Henry II. It is said that the manor was owned by a rather uncaring Lord of the Manor, Sir Roger Tichborne. His wife. Lady Mabella, lay on her death bed and asked him if he would set up a bequest and provide income for the poor after her demise. He agreed, but said only wheat from land she could walk around whilst a torch burnt, could be provided knowing perhaps this would rather restrict her bequest. Yet although she was too weak to walk, she did succeed in crawling around a twenty-three acre field, now called ‘The Crawls’ (north of Tichborne Park, beside Alresford road). Probably astonished he did establish a bread dole which continued from that date until 1796. In 1796 it was suspended, as the local magistrate was concerned that the tradition attracted too much itinerant people and the crime associated with strangers in the village. Yet, the suspension did not last long because it is said of a curse laid down by Lady Tichborne, maybe to ensure that future Lord’s were not as cruel as her husband. It is said that if the dole was stopped there would be a generation of seven sons, would be followed by one of seven daughters and the family name would become extinct and the house collapse. It is said that part of the house did collapse in 1803, an indeed, Sir Henry Tichborne, himself a seventh son, in 1821 produced seven daughters! As a consequence the dole was re-established and soon in 1839, a nephew was born, Roger soon followed by a younger brother called Alfred. However his brother Edward did have a son, Henry, born in 1829 but he died in 1836 aged six years old. At this point, fearing that the curse had come to fruition, the Dole was resumed. Edward became the 9th baronet but had no sons. Another of the seven brothers, James, became the 10th baronet. He had two sons, Roger, who was born in 1829 (before the Dole was resumed) and Alfred, born in 1839 (after the resumption of the Dole). Roger was shipwrecked and lost at sea (1854) and Alfred eventually became the 11th baronet on his father’s death in 1862. Sir Alfred died in 1866 leaving his wife pregnant with a son, Sir Henry Doughty-Tichborne, 12th Bart. Interestingly, the male heir to the estate was lost in 1845 during sea voyage and his brother took the estate. However, this was not the end of the story, for two decades later he re-appeared and claimed the estate. A cause celebre court case begun which proved the man, real name Arthur Orton, to be an imposter! 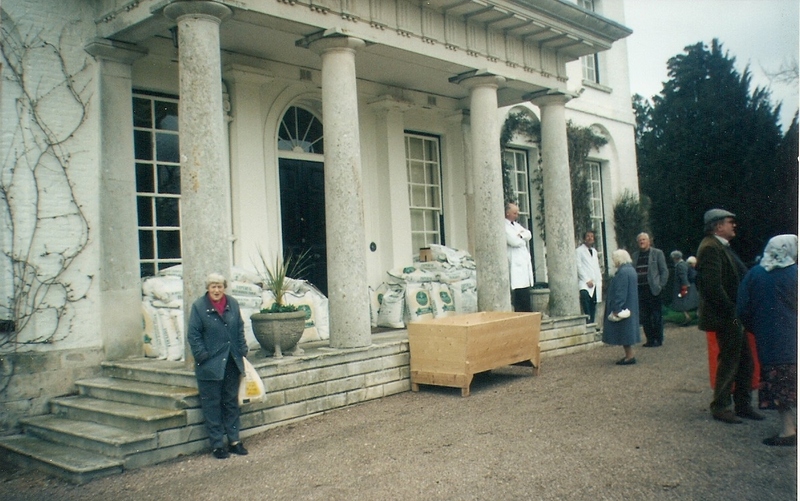 I had the opportunity to witness the dole in 1996 on a grey but dry 25th March, within the last few years the current owners, the Loudons, had recently let out the hall but the family was still present with a Mrs, Hendrie the sole descendent of the Tichborne family. It was a cheerful and strange affair, where all and sundry were invited into the grounds of this usually private estate, although only those from the parish and neighbouring Cheriton and Lane End, where at the halls steps could be found a large wooden box and surrounding it about 40 20 litre bags of flour. Local people assembled in their numbers. 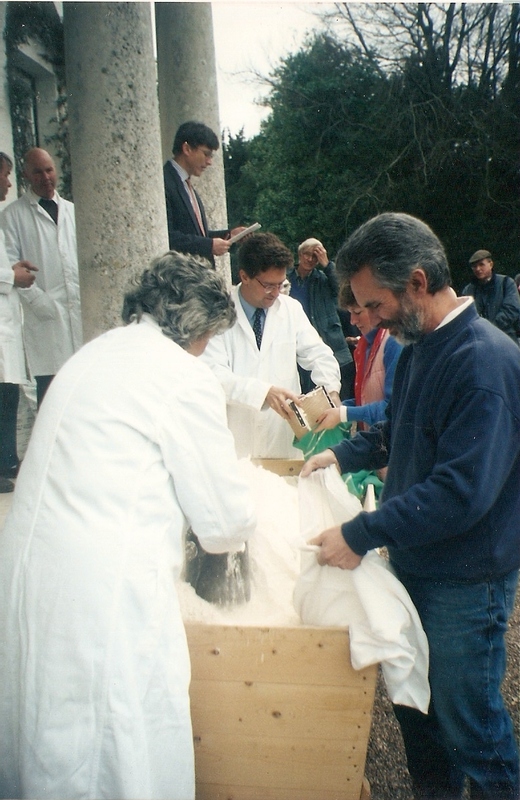 They appeared to be clutching plastic and more substantial bags, after a gallon of flour was the allocation, with children half a gallon, so something substantial was needed! 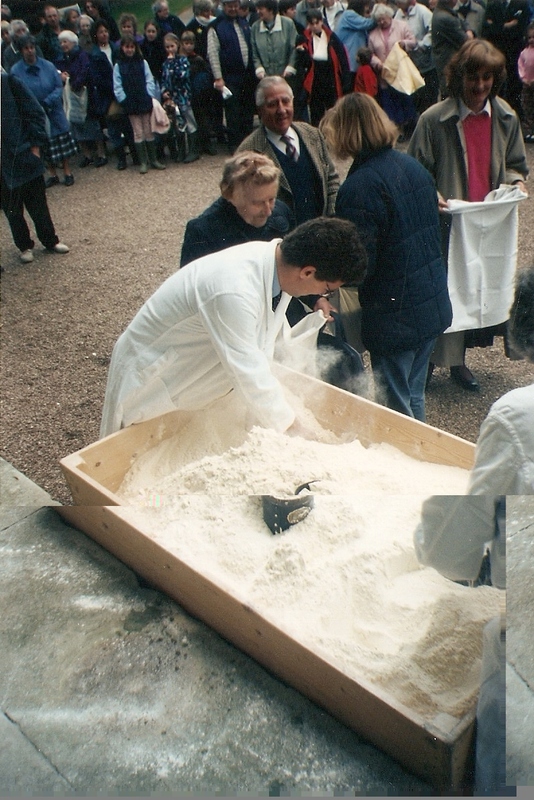 The flour was poured into the wooden box, bag by bag. Once it was filled the local Catholic Dean of Winchester blessed the flour and sacred oil sprayed over it and incense wafted over it, in a ceremony probably not dissimilar to that which happened pre-Reformation. After a few words were said over it, a list was read of those who could claim it and Mrs Loudon now wearing her white coat used a bucket to pour into the first claimant’s sack. So it continued until after about half an hour or maybe a bit over, the last gallon of flour was emptied into the last bag and the assembled team of distributed disappeared for a good earned rest no doubt. And so I am sure it continues because despite the changes of ownership of the estate and usage, a stipulation of the ownership of the house is that the dole continues….a no-one wants to evoke the curse again! Copyright Pixyledpublications contact me if you wish to use the photos!